Does everyone else have this cookie? Whether it's necessary (in which case, maybe it's time to change the name)? A very long time ago there was a website called Stack Overflow Careers. I worked on that website and needed to count things like unique visitors to jobs pages, and unique people using the search function. 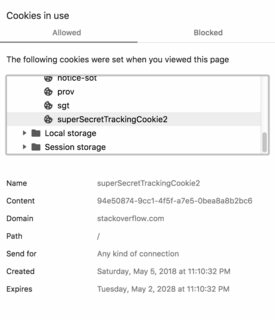 I created...the SuperSecretTrackingCookie. Years later SuperSecretTrackingCookie fell out of fashion for SuperSecretTrackingCookie2, which fulfilled the same purpose. Years after that Stack Overflow Careers was Unificintegrated with Stack Overflow under the Jobs Tab. And the SuperSecretTrackingCookie2 made its way to Stack Overflow. So no, there's no nefarious purposes, just counting. For anyone in the comments disappointed you didn't have the cookie, we'll bake you a fresh one if you view a job on /jobs. Do Votes timeout? How to effectively vote on old questions then?